I am a very lucky lady indeed. Besides having a wonderful hubby, children and friends, I am also lucky enough to have parents and a sister that always have my back and are my biggest fans no matter what I choose to do. They are also all avid readers of my blog and let me tell you that if I am not blogging enough in their eyes I hear about it, most especially by my most vocal fan; my mother! My mom is the person in my life that views me with rose colored glasses. I tend to think that most people have such a person in their life that does that for them; I cannot be the only lucky one!! The woman thinks I am flawless; that alone makes me smile from ear to ear when I think about it. Well, now I am going to have to be blogging a great deal for my number one fan as she will be stuck at home quite a bit over the next few weeks. Unfortunately, she took a bad fall last night and broke three of her ribs :-( Marc and I had just come home from Ethan's school open house and we received a call from my dad that he had just taken her to the emergency room since she had fallen and was in a GREAT deal of pain. I knew that the fall must have been a bad one as my mom is tough as nails in the pain department. She never complains when she is ill or is hurt. Unfortunately, there have even been times that she has had an accident and hurt herself and did not tell us until waaay after the fact. She never never likes to complain but this time was different. My sister even knew it was different as she wanted to jump on a plane to be with mom when she heard that dad had taken her to the ER. Mom was not only in horrible pain but was having a hard time breathing. I ran right up to the hospital after getting my dad's phone call and by then she had talked the doctor and my dad into not staying in the hospital for observation where they would have liked her to stay....what a piece of work..... STUBBORN is really too easy a term for my mom! Mamasona, (that is my pet name for her) there is only one thing to do for this girl's number one fan and that is to grant your fondest wish ~ so I will hereby swear to blog every day with the cute and funny things that go on in the Dynamic Duo's life until you are out running around town again like you always do. Goodness! 3 ribs!? Your mom does nothing halfway Lori! Talk about going for it all! May she heal quickly & may the pain ease up. Please let me know if I can help in any way. OMG, Lori!! what a scare!!!!!!! I hope your mom gets well soon!!! sending you and your family lots of positive and healing thoughts!! 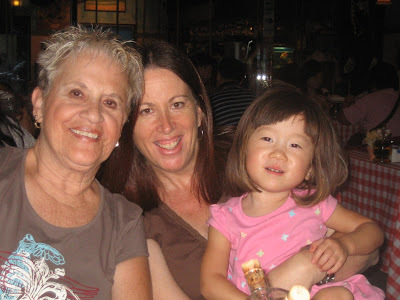 I so enjoyed "getting to know your mom" during your trip to China for Ethan. Hope she feels better quickly! Lori send your mum a great big hug...not a tight one though and tell her we all send her our love. Feel better soon Lori's mum. So sorry to hear about your mom. I have a similar relationship with my mom. We are very fortunate to have them in our lives. Well wishes and a speedy recovery! hope she will be up soon!! I hope you keep your mother entertained so that she can forget about the pain and heal quickly. Only serious writing though, you don't want her laughing. You are so lucky to have such a person in your life. Send her our love and all our hope for a speedy recovery. Ack! So, was she dancing on the table again or doing the limbo? ;-) Hopefully the doctor gave her some pain medicine so that she can get some relief and HEAL. Poor thing! I know your mom has gotten on me about my not blogging enough, so I too will now try and do a bit better! Family. Didn't she just haver surgery on her knee? I hope this didn't have anything to do with that. Send me your mom's email and I'll give her access to my blog to help keep her occupied. Wishing her the Best! Seriously, we wish you a speedy recovery. You are going to have to stop swinging from the chandeliers - I have told you it is dangerous. Big (painless) hugs from the Choi family. I am also going to send a shout out to your Dad, who is going to need a lot of help keeping your mom entertained over the next few weeks. Hope your Mom gets well soon and the pain subsides or is manageable with meds. My Mom broke her rib last month, and she says it is very painful. Hope Mamsona gets lots of TLC!!! Get well soon Mamasona! So sorry to hear about your tumble (did those gymnasts on the Olympics inspire you? :). Feel better soon. We'll be thinking about you.